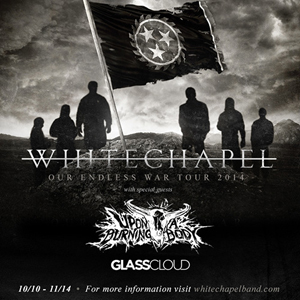 Top 10 Billboard charting metal act WHITECHAPEL will be returning to the road in October and November! In their interview with Phil Bozeman, Alternative Press declared that "WHITECHAPEL put in a lot of blood and sweat to maintain their furious reputation", and that work will continue on October 10 when their next North American headlining tour begins. The tour features support from UPON A BURNING BODY and GLASS CLOUD and includes SLIPKNOT's KNOTFEST 2014 at the San Manuel Amphteatre on October 26 in San Bernardino, CA. Tickets for WHITECHAPEL's headlining tour will be on sale on Saturday, August 23rd at 10am local time for each show. Our Endless War is WHITECHAPEL's most streamlined, atmospheric, and emotionally powerful release. The album debuted at #10 on the Billboard Top 200 Chart, #2 on the Billboard Top Independent Albums Chart, #1 on the Billboard Hard Music Albums Chart (Current) and #2 on the Billboard Rock Albums Chart. The album was released in April of 2014 on Metal Blade Records worldwide.